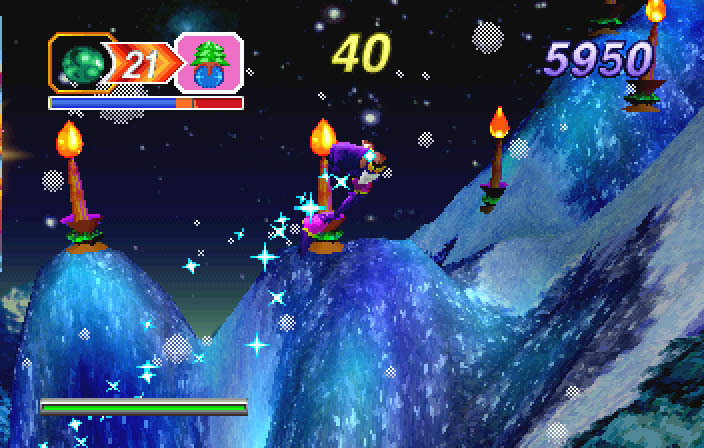 The game featured 2 levels taken from Nights…Into Dreams but re-worked with Christmas themes throughout. The story was basic but involved Elliot & Claris again during the Christmas season set after their adventures with Nights. Both love the Christmas season but something feels like its missing. The 2 children discover that the Christmas Star that normally sits atop the Christmas tree in their town of Twin Seeds is missing so set off to Nightopia to find it. In Nightopia they once again meet up with Nights with the first level becoming available to play from this point on. Spring Valley is now available to both characters (In Nights….Into Dreams it is only Claris’ who can play it). Elliot’s version of the level includes minor changes such as the layout of items. 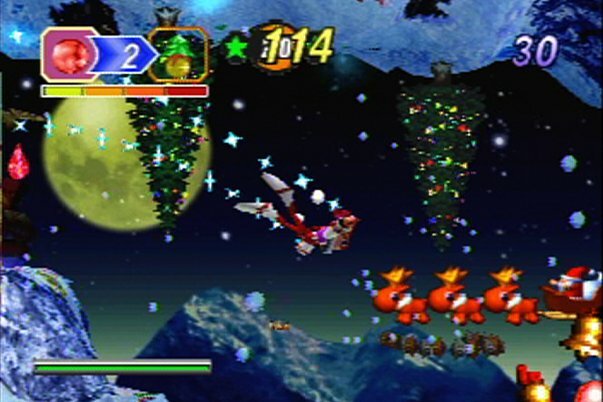 The 2nd level is a boss battle against a revived GIllwing who has the Christmas Star in his lair. Beat him to get it back & finish the short game. You could be mistaken for thinking that Christmas Nights is basically a demo fitted with Christmas themes & you’re not wrong but there is more to it then is first obvious. The game reads the Saturn’s internal clock & changes elements of the game accordingly. In November & January the game becomes ‘Winter Nights’ & the normally green land becomes covered in snow. During this period the weather will change depending on the hour. Play during December to activate ‘Christmas Nights’ & get the Christmas alterations (they include presents replacing item boxes & characters wearing costumes). 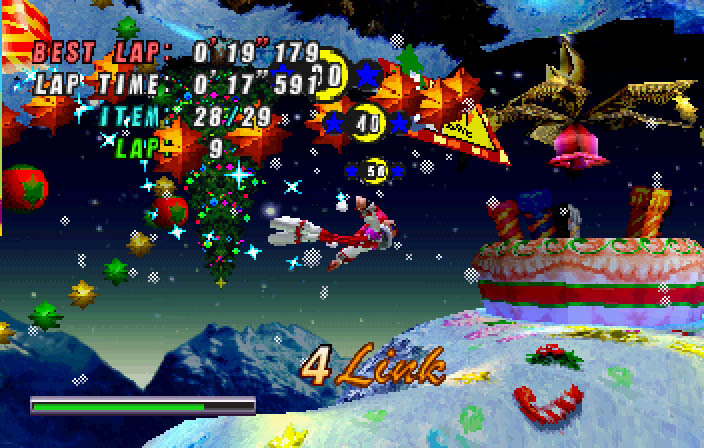 The music is also adapted to play a rendition of ‘Jingle Bells’ as well as the boss theme being re-worked. Additionally play during New Years, Halloween & April Fool’s day to experience a few more changes (Play as Reala on April 1st). The gameplay is as solid as you would expect & if you’re a pro at Nights…Into Dreams you won’t have any problems here. You can unlock additional character artwork on the disc & mess around with several in-game options such as the music & time attack modes. 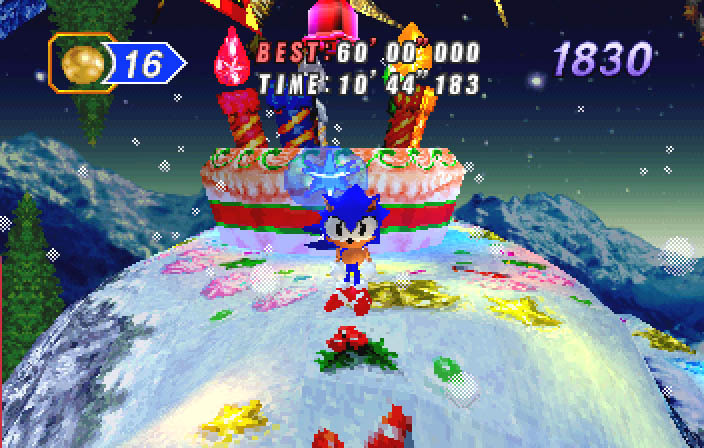 Finally it is possible to play a demo stage as Sonic the Hedgehog in 3D….Called Sonic the Hedgehog: Into Dreams, Sonic has the run of Spring Valley as well as doing battle with bouncing version of Dr Robotnik. It’s a nice touch was pretty much the first time Sonic was playable in full 3D. 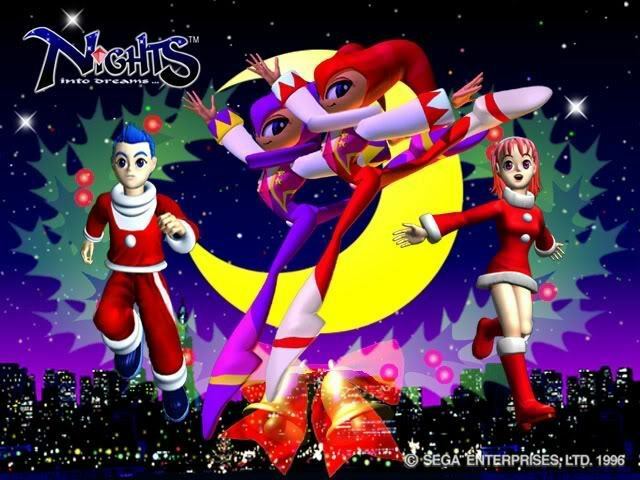 Christmas Nights is a free demo but one treated with the love & care of a fully released game. 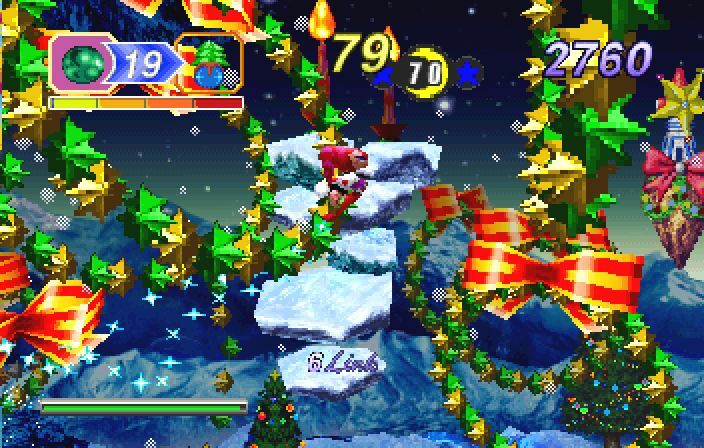 The world of Nights was perfect for Christmas. It used to be heavily sought after on auction sites but since the release of the HD Version of Nights it was playable once you cleared the game once.